What Indian feast is ever complete with out traditional Indian Naan? It’s slightly sweet taste and chewy texture is a pure delight and completely necessary in the makings of a proper Indian meal, for dipping in the rich and tasty sauces common in this particular type of food. In case you are intimidated by bread-making, don’t be. As with any other yeast-bread, all you need to remember is that yeast + warm water + flour = bread (plus a few other ingredients of course) but you get the picture. So, to take the intimidation out of the process, I photographed it (with the help of my hubby, turned sous-chef.) 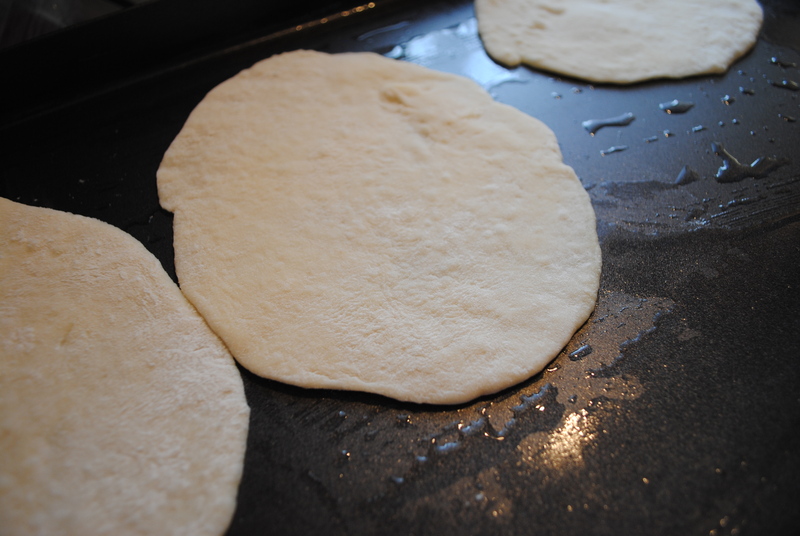 What I have is a step-by-step guide to making perfect Naan. It’s worth the effort and I promise you will be pleased! 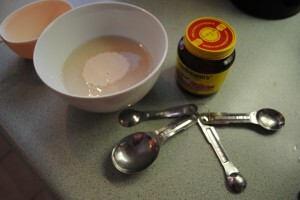 First, measure out 1 over-filled teaspoon of active dry yeast into 1 cup of warm water, mix and let stand for 10 minutes. Next, combine 1/4 cup white sugar, 3 TBSP milk and 1 beaten egg. 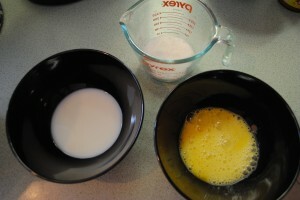 Add the yeast and water into the sugar, milk and eggs mixture. Kneed the dough on a lightly floured surface for about 10 minutes until mixed well and smooth. 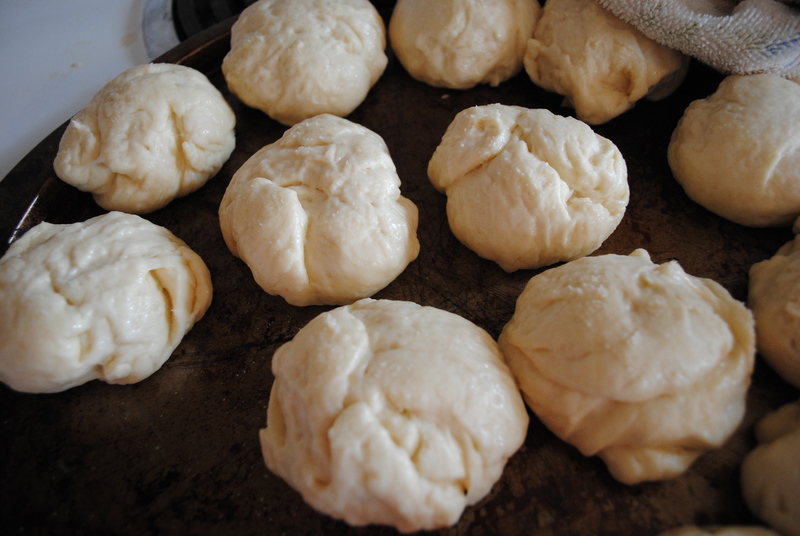 Place the ball of dough into a well-greased bowl, cover with a towel, and place it somewhere warm to rise for 1 hour. 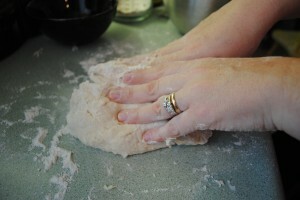 Once it has risen, punch it down and knead a little more. 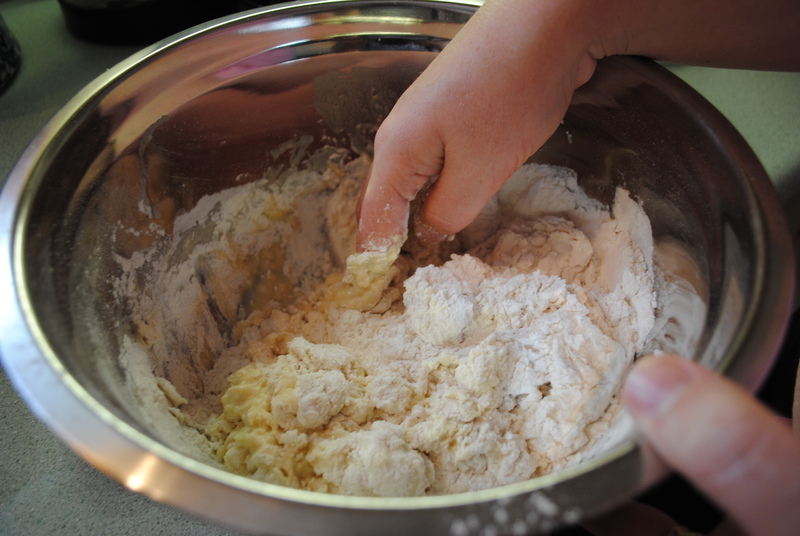 Pinch off small hand-fulls of dough (slightly larger than a golf ball) and roll them between your palms into balls. Set on a baking sheet, cover with a towel and set aside again to rise for about 30 minutes. Now your Naan is ready to roll out. Take each ball of dough, and flatten by rolling out with a rolling pin. Place each round of Naan bread on a lightly greased grill or frying pan, and fry on each side for about 3 minutes until they turn golden and bubbly. Serve with your favorite Indian dish and Enjoy! Fantastic – love the step by step photos. Is like being able to watch. And good to know what is “supposed” to look like along the way. 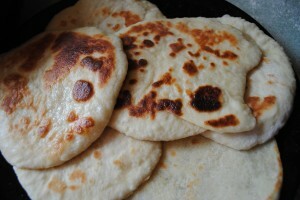 I will definitely be using this recipe, as my family cannot get enough Naan Bread! I think about a dozen small Naan. I have used larger Naan for pizza crusts and then we BBQ’d them on the grill. Absolutely delightful and so much fun to create! My grand daughter says this is called Roti bread.